Road and Track tended to be a bit dry and serious, but their writer Henry N. Manney III compensated for that with his antics and humor. 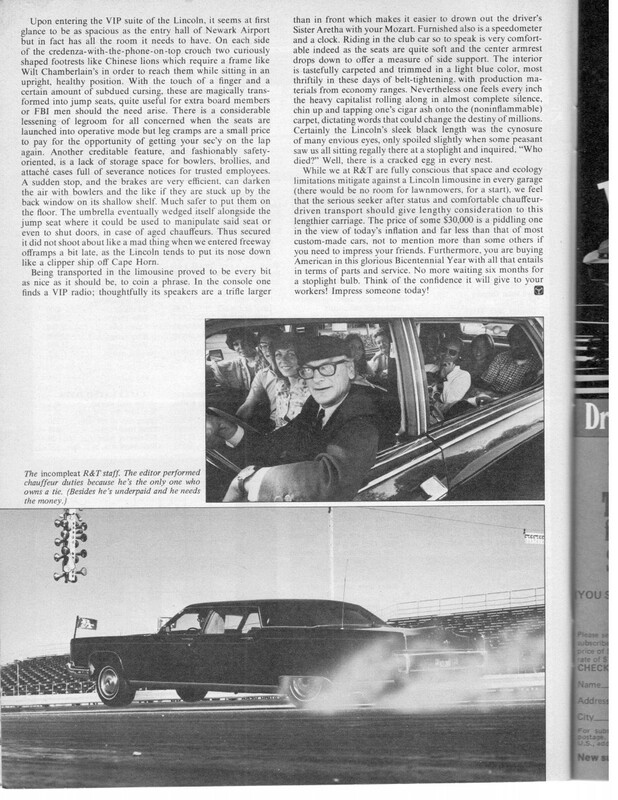 Here he takes on a review of a Lincoln limousine. Great article; love the R&T-trademark profile drawing on the summary page. 0-60 in 11 seconds is impressive for this car. the car itself is impresive. good old American luxury!!! Yeah I noticed that too. Then I looked at the weight, 6100 lbs, the HP/TQ 208/338 and I thought “Nah, not happenin”. But then, this IS Henry Manney! They hint that this one is devoid of the emission controls typical of 1976. That’s because this is a 1973 Continental, as is clear from the rear door beltline, side window shapes, and particularly the 1973-specific front bumper. Agreed, impressive performance for what it is. 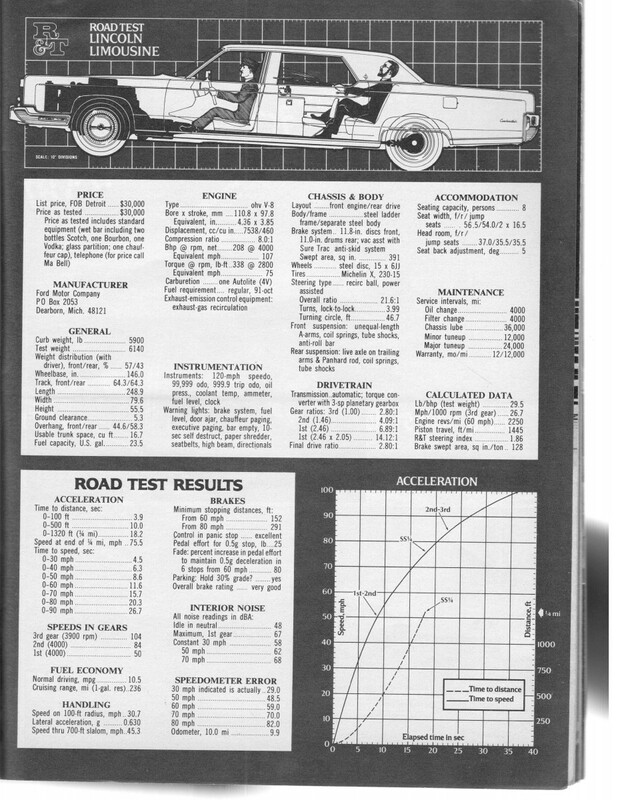 However, even a ’73 was plenty smog-choked, with a physically retarded cam, EGR, low compression, TCS spark advance and all the other stuff. FYI this sticker rated the max safe weight of the car with full passenger load (In this case, approx 5100# curb weight + 6 pax@150 each plus 100 pounds of cargo). I don’t know how many arguments I got into with assorted dimwits over that door tag. “My ’75 Cougar weighs 5400 pounds, it says so right on that sticker”! Uh, no. I am thinking that I have seen one or two of these at shows or auctions here or there over the years. 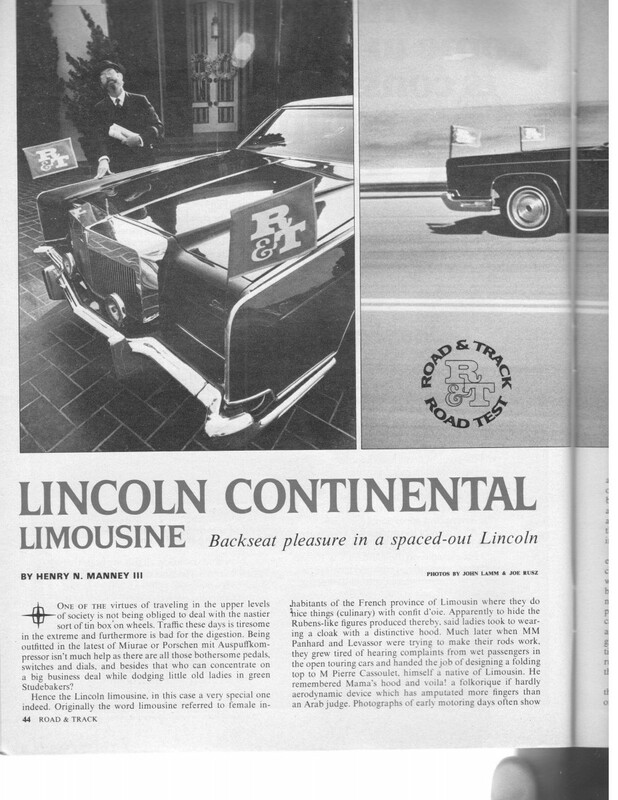 Two questions come to mind – I do not remember Lincoln making much of a splash in the limo field after the early 70s despite having that same big car all throught the decade, and I wonder why not. Also, what possessed them to put that half-assed tire hump on the decklid. Give it a tire hump or don’t (and I would choose don’t) but for crying out loud make it a real one if you are going to do it. I suppose that the hump, along with the glitzy grille, were probably intended to give some sort of Mark IV look. Wow, I glazed right over the year of the car in the title. I looked at the pictures and saw a 72-73 Continental based on the C pillar. Fun article, as usually was the case with Manney. This massive Lincoln beast weighs less than some of the SUVs available today! 60-0 in 152 feet! That’s better than the BMW M1. One of the few R&T articles I remember from back then. I got a tour of the Lehmann-Peterson shop in 1975 while on an epic road trip that summer because I was curious how the firm built limos for Lincoln. Impressive to say the least, these cars were massive. 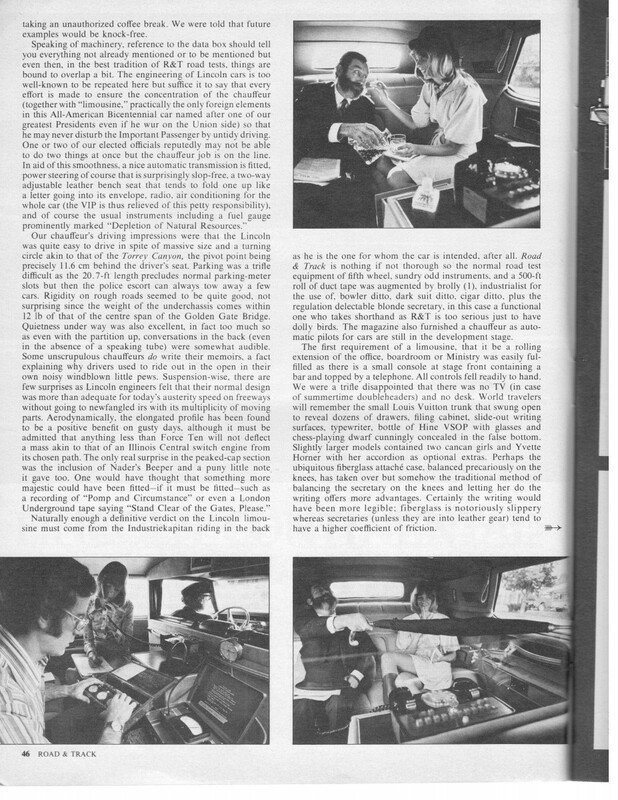 R&T’s greatest articles were April Fools, when Manney himself would test fire engines, a Budweiser delivery carriage with 4 horses (you have to see it…desceiption is nothing), a road, and so many more I don’t remember. Yeah, sometimes, Rodent Truck wasn’t too bad. Didn’t quite make it to Car & Driver literary standards, but much better than Moto Rooter, Peterson Publishing Company dreck. Alas, Peterson has owned Car & Driver for a while now. Hell, they may even have Road & Track, too. I remember the Greyhound bus, the Mercedes-Benz GT (garbage truck), and the Jaguar XK-EE with a 12-cylinder inline engine. Not a limo in the conventional sense (i.e stretched once at the B-pillar). More like a stretched sedan. A little research shows this to be an Andy Hotton conversion. Formerly known as Dearborn Steel Tubing (The folks who brought you the ’64 Fairlane Thunderbolt), a longtime FoMoCo affiliate. A few years earlier, the same company attempted a “budget limo” based on the LTD, without much success. What state agency in their right mind would want to look un-prosperous. AFAIR, one of these appeared in an early episode of Mission Impossible. 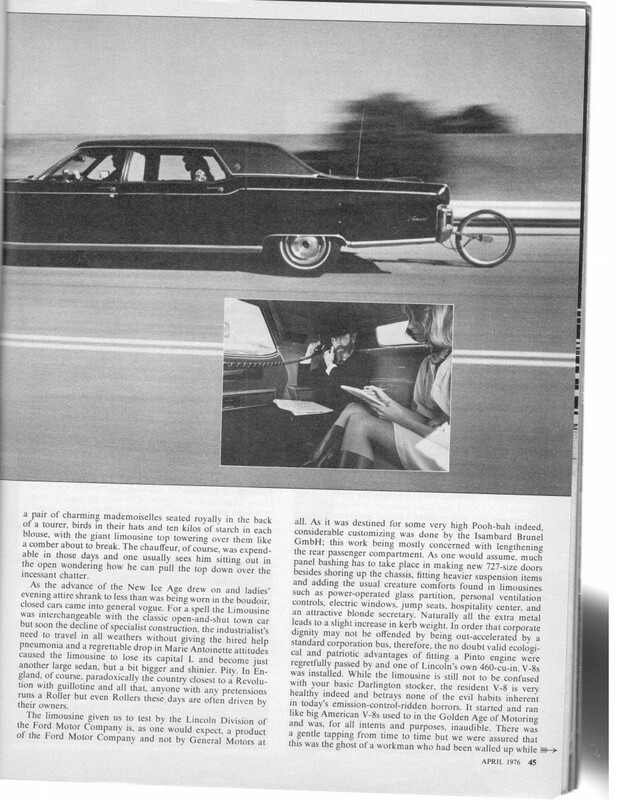 The Lincoln Continental limousine is a 1973 MY by the extended front bumper unique to that MY, in combination with the loop rear bumper (1970-’73). It was built by Andy Hotton Associates, Inc. of Belleville, MI, not Lehmann-Peterson of Chicago. Built from the standard four door sedan, the chassis was stretched two feet, one foot for the rear doors, the other foot between the rear door cut-line and fender skirt. This was a far more involved and costly method to build a limousine than the inserted length at the B-pillar that was common with Maloney and other stretched sedan limousine builders. Being driven around by a chauffeur leaving the passenger free to engage in productive work or non productive leisure still seems like a worthwhile luxury. Like the “Lincoln Lawyer” you could get a lot of work done on your laptop computer, take and make phone calls, review files, watch news casts, and even print out documents from a laser printer. Not to mention carry on an extended client meeting on the way to lunch or the airport. What a great way to make up for all that dead time lost in urban traffic delay. I just realized that it’s our kids now who enjoy all the luxury as they are shuttled around in their Mom’s minivan or SUV. With a rear seat DVD player or their cell phones they are easily able to amuse themselves. Article of the week! I’d never read his work before but we need more Manney. I enjoyed the rest of the article, but the frequent sexist comments are jarring. At the time I suppose we enjoyed or tolerated them. Did women read R & T at that time, and how did they react? Look on page 4 of the article, where the editors doctored the picture to make it look like it’s doing a wheelie, while it’s burning rubber. I’m so glad to see this posted – I remember reading it many, many years ago when our library had a decade of back issues and I’ve periodically searched online for an image of it but never could find a copy. They also did a test of a blimp and I think a WWI Sopwith Camel (see my avatar). It would be great if someone could find and scan the whole set of R&T’s April Fool’s reviews.